Welcome to CEDIA 2006, the showcase for home theater, home automation and electronic lifestyle technologies! Held this year for the first time in Denver, Colorado, and second only in size to CES, CEDIA is extremely focused on the audio/video market and is one of the most popular events for the launch of new products. Our CEDIA Expo 2006 Video Report gives you a taste of what it's like to be at CEDIA, as well as showing you the latest remotes and accessories in development including the AMX Mio Modero R-4, Logitech Harmony 1000, Philips Pronto Professional TSU9600, RTI T2-C & M2, Samsung MFR, UEI SIRIUS Conductor, URC MSC-400... and don't forget the amp toss! All videos: WMV.9 format - 8 minutes, 24 seconds. 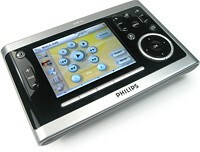 (September 13, 2006) - Philips' new touchscreen remote control offers a high-resolution display, WiFi networking, rechargable lithium ion battery, 64mb of memory and much more! We've got the first juicy details and photographs. 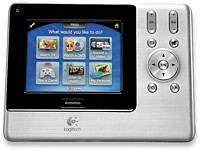 (September 12, 2006) - Logitech's first touchscreen remote control offers a 3.5" color display, rechargable battery, optional RF extender and activity-based programming. We've got the press release and first photos.